Keep items close and handy while you relax on the sofa with the Ameriwood Home Eastlin End Table. 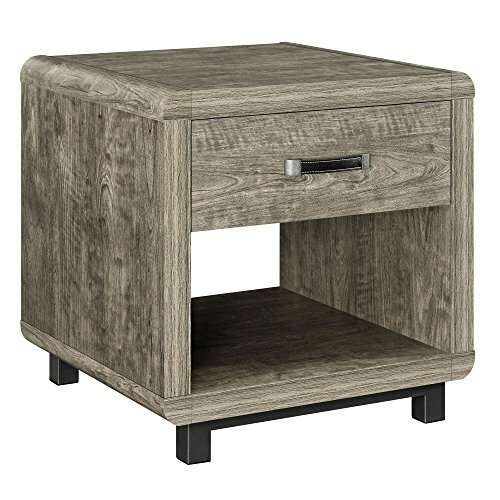 The End Table is the perfect home for electronic devices, books, coasters and remote controls. With a top drawer for concealed storage and an open bottom cubby, you can keep important items in a convenient, accessible location right beside your couch or chair. The flat top surface is also the right size for a small reading lamp if you need extra lighting. A beautiful brown cherry finish, rounded corners and a decorative leather drawer handle come together to create a remarkable design that’ll shine in your living room. The End Table has a thick, hollow core frame with a powder-coated metal base, and the drawer is constructed of MDF and particleboard. The table measures 21.6"h x 21"w x 20"d, and assembly is required.